Hidden away in a little known and seldom explored corner of the Cascade Mountain Range is the historic hamlet of Mineral, Washington. Here the wildlife is bountiful and the landscape breathtaking. Mineral offers fabulous views of Mt. Rainier and easy access to Mt. Rainier National Park and the Gifford Pinchot National Forest. This Gem of the Northwest is less than two hours from Seattle, Washington or Portland, Oregon and has something to offer everyone from steam train enthusiasts, to hikers and bikers, birdwatchers, hunters and fishermen, skiers, boaters, vacationers and campers. While Mineral Lake is the home of the ten-pound trout, nearby streams and rivers offer an abundance of salmon, steelhead and brook trout. If fishing is not your passion, perhaps you would like to visit two of the major mountains in the United States; Mt. Rainier and Mount St. Helens. Both are accessible by auto and offer world-class photo opportunities, hiking trails, wildlife viewing and natural history interpretations. For those looking for a fabulous, centrally located wedding location look no farther than Mineral. Visualize an outdoor wedding with Mt. 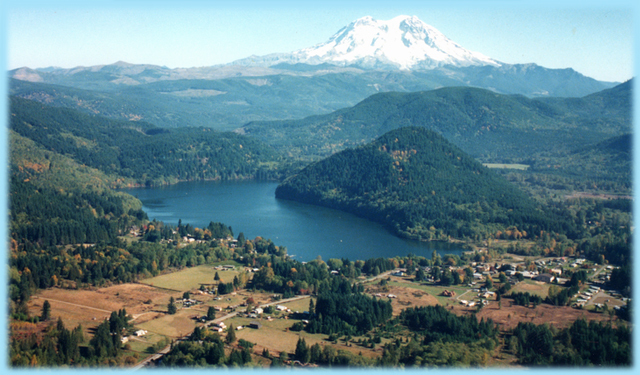 Rainier and pristine Mineral Lake as the backdrop. The affordable but luxurious local lodging offers a perfect place to honeymoon as well. There are more activities, events, vacation opportunities and fun things to do in our area with something for everyone. Come, get away from the everyday hustle and bustle and experience the beauty and hospitality of our unique little town.